And I'm back. We've been SO busy framing our house. I'll share details later this week. I thought I'd kick off the handmade gift parade with a special commission I received from Santa. Dolly received a cute little Calico Critters raccoon family that her mama had as a child. This little family needed a home...and Santa asked me to make it. I originally found this tutorial, and have had it saved for a while. (Pre-pinterest), which I finally transfered to my board. The tutorial was a little tricky for me to understand, but after reading through things several times, and also finding Serving Pink Lemonade's version, I was ready to proceed. 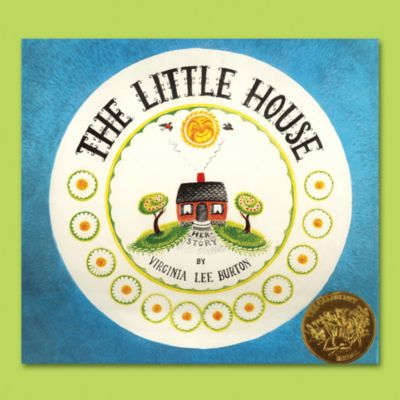 My design was based on the lovely illustrations of Virginia Lee Burton from her book The Little House. One of my all-time favorite stories. I enlarged the pattern a little to keep the scale the same as the little family. 3 plastic mesh pieces at 5"x7"
2 plastic mesh pieces at 3 3/4" x 7"
2 house side mesh pieces 5"x"5 with a 3 3/4" rise on the triangle. outer house: 17" x 8"
house sides: 6"x 5 1/2" with 4 5/8" rise on triangle. Here are a few more helpful hints that I used to make this little fabric playhouse. I sewed batting slipcovers for each mesh piece. The seams were about 1/4", which I then trimmed. Once the inner and outer pieces were put together, I applied interfacing to each. Then I had a ball creating appliques. I think the laundry line might be my favorite. To make mine, I satin stitched the laundry line in grey. Using the hem of an old sheet, I created three mini sheets that I sewed wrong side up to the line. I then folded them down and sewed them in place with satin stitched clothespins. I love that the house looks happy. Ever applique was first attached with heat n bond lite, and then satin stitched into place. Here is the kitchen design. I created it out of felt, and used my sewing to create different areas. It had to have an apron front sink! By far the trickiest part was putting the house together. I got everything sewn together and turned right side out only to find out that I'd missed a seam. I recommend folding the side pieces to the floor of the house with a strong safety pin. I had so much fun creating this little house. One word of caution, I think I made the elastic loops that hold the house together too loose. When the house is closed, the sides bow out a bit more than I'd like. All in all, I'm tickled with how it came together, and so is Dolly. Sharing with Freckled Laundry, Tatertots and Jello, and Bubbly Nature Creations. It turned out to be absolutely darling - my favorite touches are the tree and the laundry. P.S. I can't wait to see the progress on your home!! What a sweet house! I've been thinking of making one. I love that yours is based on a book. How cool! Just perfect! Love everything about it. That is seriously cute - love the tree especially - I have it on my to do list - one day one day. Stinking cute! Glad to hear framing is underway. Oh, gorgeous, gorgeous, gorgeous!! I love it and I want to move in right now!!! adorable! i am so impressed. i also loved The Little House book. I got it from the library recently and shared it with my kids for the first time! You are so clever! This is utterly adorable. We LOVE this! This is SOOO adorable!!! Love the tree and the clothes line... I bet your little girl loves it!!! What a great house! I would love it if you would share it at our Sharing Saturday link party at http://craftymomsshare.blogspot.com/2012/01/sharing-saturday-remake.html. Thank you! Thanks so much for linking up at the party!!! Hope you have a great weekend!!! I have that project in my to do list for ages! Didn't have the chance to get to it! Yours is adorable! the laundry rope is so fun!! And the entrance of the house just put a smile on my face! I wish you and your family a fantastic 2012! Sweet Chris!!!! I haven´t been around in a while... but I´m here now and amazed at this little beauty!!!!! Wow!!!! I want to make one for my little G now! Just when I thought I was checking projects off my "To-Do" list faster than ever before... you came along and inspired me!! This is amazing, Chris! So adorable. I love that you based it on a book. Great job!